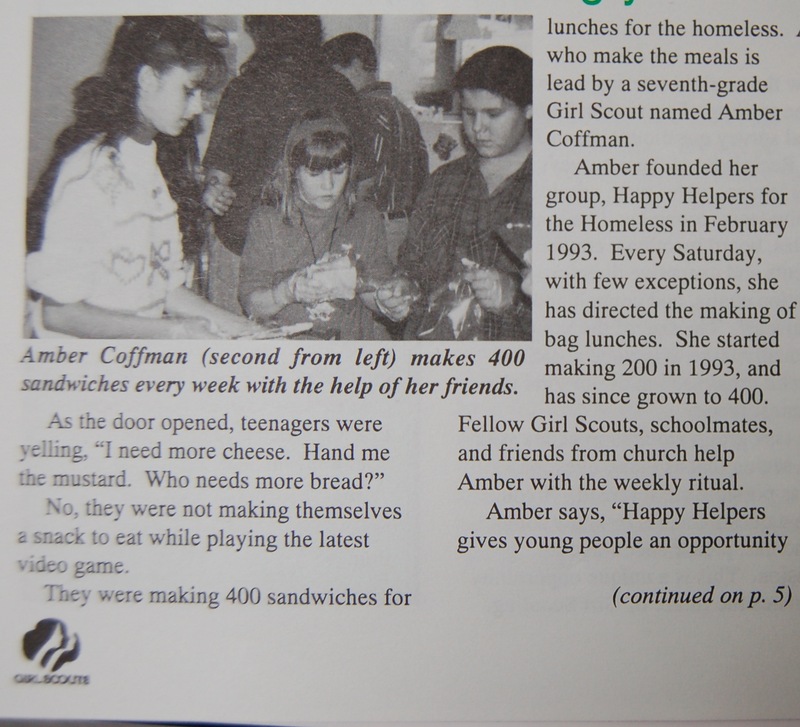 An excerpt from a GSCM newsletter article about the founding of Happy Helpers for the Homeless. On Monday morning, students at Glen Burnie Park Elementary School filed noisily into the school gym and sat criss-cross, fiddling with shoe laces and chattering excitedly as they waited for the day’s assembly to begin. Eighteen years after founding Happy Helpers for the Homeless, an organization that distributes food and toiletries to homeless people in Baltimore and Glen Burnie, Amber Coffman, a Central Maryland Girl Scout Alumna, returned to her roots at Glen Burnie Park Elementary to be honored for her achievement and dedication to service. The organization began as a small operation when Amber was in the third grade. Amber, her mother and her friends would gather in their kitchen on Saturday mornings and make 200 bag lunches to distribute to the homeless and various shelters in Glen Burnie and Baltimore. Today, the organization is still going strong with a headquarters located in Baltimore and more than 100 volunteers helping each week. Amber said that over the years more than 700,000 lunches have been distributed in Baltimore and the organization has spread across the country and beyond. Amber challenged the students to take their education seriously and to fill their hearts with compassion for those around them. Watch the video to see Amber talk about the founding of Happy Helpers for the Homeless and how her volunteer work has shaped her life.